How do I upload a spreadsheet or CSV of candidates to a Gem Project? 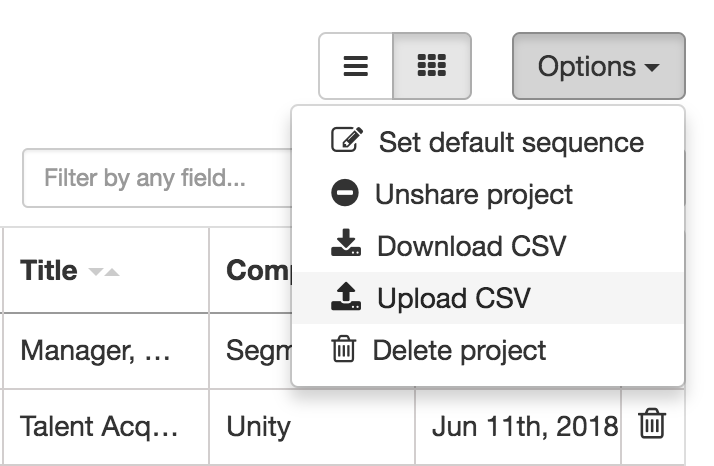 You can upload a CSV of candidates to a Gem Project by clicking Options>Upload CSV from your Project page. From there, Gem will import the first few rows as a preview and ask you to specify which columns map to each Gem field (e.g. First Name / Last Name / School / Company / etc...). If your spreadsheet was downloaded from another Gem Project, Gem will automatically match the column names with each field. Override fields for existing users. Checking this option will overwrite candidate fields (e.g. Name / Company / School) with the values from your CSV if the candidate already exists in Gem. Otherwise, Gem will only fill those in if the fields are blank or the candidate doesn't exist. Autofill email addresses for each recipient. If you check this option, Gem will search and attach any email addresses Gem can find to each candidate you upload. First row contains column names. Checking this option lets Gem know to skip the first row of your CSV because it contains column names. Gem will upload in batches and report on progress as each batch finishes. It can take some time for large CSV's to create all the Gem people (especially if you autofill email addresses for each recipient), so bear with us. My upload fails or only imports some candidatesIf your upload fails, it's likely because one of the rows in your spreadsheet is malformed. Try looking at your project for the last candidate that was successfully uploaded to know which row or rows in your spreadsheet may be causing trouble. If Gem successfully finishes the upload, but doesn't upload every candidate, it may be because some of your candidates have invalid public LinkedIn URLs. Need help importing a CSV into a Gem project? Feel free to reach out to the Gem team by emailing us directly at support@gem.com or press "Chat with Us" in the Gem home page.